Swimming is one of the more popular sports in the world, and there are certainly plenty of injuries associated with it, although many of them are different than other sports. Swimming injuries tend to be of a different caliber since the water’s buoyancy often helps to prevent injuries common with other sports that lead to joint damage from feet hitting the ground. Here are some common injuries in swimming, including what you can do to prevent or mitigate them. One malady that people who swim a lot often end up with is an infection of the outer ear canal called “swimmer’s ear” colloquially. It occurs when you’re swimming enough that water ends up inside the area that goes from your eardrum to the open air. If you’ve ever gone swimming before and felt water in there afterwards that didn’t empty out, then that’s exactly what can happen here. If the water stays in there too long, it can become a problem in terms of serving as a breeding ground for an infection. You can also get it by putting anything in your ear too harshly since the thin layer that protects your ear canal can become damaged and subject to bacterial infection. If you feel redness in the ear or partial drainage of liquid coming out of your ear, or else itching, discomfort or other ear symptoms, this can indicate you have this problem, at an early stage. You can speed up recovery by using antibacterial medication that your doctor can give you. Another approach is to use a slightly acidic solution to help put your ear’s environment back to where that it’s supposed to be, namely a bad place for bacteria to live. You can prevent this from happening again by using swimmer’s ear plugs to create a seal so that water can’t get stuck in there again. This is definitely one of the more common injuries you can sustain while swimming. You’re going to depend on your shoulders a lot doing all the strokes required in order to swim fast through the water. In particular, you could end up with trouble with your rotator cuff or what’s called biceps tendonitis. Essentially, the tendons and muscles that make up your shoulder including specifically around the joint can become strained or even torn. The key is to stretch before and after and not overdo it while swimming. It’s especially important to be careful about monitoring the situation since you don’t want your shoulder to become too painful to move while you’re still using it to stay up in the water. In other words, if you just do regular running cardio without moving your shoulder too much, you can still work out and stay in shape even while you’re nursing an injury to your shoulders. You don’t have to stay completely immobile. This should make it easier to convince yourself to stay out of the pool for a few days while you’re shoulder makes it back to the shape that you want for it. If you usually train with a kickboard, you may want to avoid using it if your shoulder is feeling strained at all. The other possibility is that there’s an issue with your stroke form. This means that you should check with a trainer to see if he can notice anything off about how you move. The treatment for bouncing back is to put ice on your shoulder for ten minutes twice per day. It’s good to do this right after you’ve been doing any kind of strenuous work with your shoulders. This type of injury is such that you can perform other exercises on dry land if you want while it’s happening. One injury from those who use the breast stroke occurs when the ligaments and tendons in your knee become strained and inflamed. This is called “Breaststroker’s knee.” This is because the stroke involves kicking your knee out hard, and whipping it through the water to get movement. It’s easy to do this incorrectly. 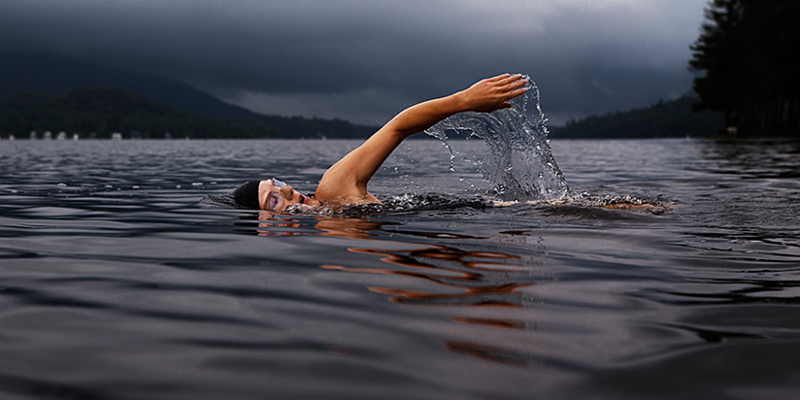 If you’re noticing knee problems and you’ve been using the breast stroke, you should switch to other strokes until the discomfort in your knee subsides. It also helps to rest your knee and hip in between sessions to let them recover before you try relying on them again. This is because those who use the breast stroke can also end up with inflamed hip tendons as well. If you avoid rotating your hip too much during the stroke, this could also be beneficial in terms of cutting down the pain you’re in and any kind of hip injury. It’s really not just older people who can strain hips. The tendons and ligaments there are just like any other that you can strain. If you vary up your strokes, this will also help to use different parts of your body since repetitive stress on one part of your body due to use the same stroke over and over can often be the whole issue. Those who commonly use the butterfly stroke can end up with pain in their lower back. If this is you, then you often need to rest for around three days. A heat pack in the lower back area can also help coax the muscles there to relax enough so that the pain goes away and you get full functionality back. Again, you should avoid doing that same stroke if you feel recovered enough to get back into the pool. You have to keep your head high while swimming for most strokes. Aa a result, it’s common to end up with all sorts of different issues with your neck. This can happen for those playing the sport for fun or as amateurs just as much as it can happen to those doing it competitively. If you move your head up out of the water to take a breath over and over again during a stroke, this can eventually cause pain in your neck, for example. This is another situation when you should really switch over to doing your cardio on dry land until you’re feeling better again. You can usually do running, sitting bike machines, and other machines for exercising without moving your neck quite as much as you do when you swim. Other approaches you can use to prevent the problem in the first place include doing shoulder rolls and neck extension stretches. You should also practice doing flips under water in order to stay away from extending your neck awkwardly in the future. In general, it’s important to switch off of a stroke that’s causing you strain, at least until you understand why. A trainer can point out how you might be doing the stroke incorrectly. You really don’t want to exacerbate the problem by continuing to do the same incorrect version of a stroke that gave you the strain in the first place, after all. You’d be surprised how quickly you can recover from these issues. For more information about how to avoid sports injuries, handle them while you have them, and recover as quickly as possible, please don’t hesitate to contact us today.